Home Posts tagged "Asian Shops"
Don’t be alarmed by the word ‘Beef’. This is a delicious Vegan satay sauce perfect for rice paper rolls or as a sauce for raw vegetables. It comes as a very thick paste that you break off and crumble up then add small amounts of boiling while mixing water to desired thickness. Comes in three coloured boxes to indicate degree of spiciness: Orange is the mildest and nicest, Red (Gado Gado) is spicy and Green is excessively spicy. 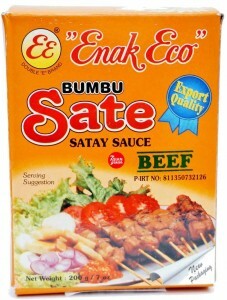 Ingredients: ground peanut, onion, sweet soya sauce and other herbs and spices.